Last week, at the Association for Unmanned Vehicle Systems International (AUVSI) conference, the Federal Aviation Administration (FAA) announced it would take part in 3 research projects to collect data about the safety of beyond visual line of sight (BVLOS) drone operations. Among those eagerly awaiting this information are both startups and heavy hitters such as Matternet and Amazon. If approved, BVLOS maneuvers could bring the concept of commercial cargo drone systems one step closer to reality. Current data suggests that unmanned aerial vehicles (UAVs) could potentially deliver a 5 pound (2.27 kg) package in under 30 minutes for as low as $1. This would significantly revolutionize traditional last mile package delivery logistics. Something that both Matternet and Amazon are aiming to do in their own specific way. Matternet, a company working on perfecting drone-based delivery, envisions the use of an interconnected quadcopter system to deliver light packages such as medicines, documents and electronic goods. Their Matternet ONE drones are programmed to autonomously follow routes plotted by the company’s cloud software, adjusting automatically for weather, restricted airspace and physical obstacles. For $5000, interested companies could own and operate a Matternet ONE. However, there are also talks of a subscription service that would lease the hardware for as low as $1000 per month per UAV. Having already tested drone operations in Haiti and Bhutan, Matternet’s most recent venture is partnering up with Swiss Post, Switzerland’s postal service, to conduct a pilot program that will explore the legal ramifications and both the technical and business capabilities of drones. Unlike Matternet, Amazon’s drone delivery system would not be based on fixed, regular routes. Rather, as per documents from their recent filing of an “Unmanned Aerial Vehicle System” patent, Amazon envisions drones that would do it all. Their Amazon PrimeAir drones would autonomously retrieve inventory from a materials handling facility, communicate with fellow drones to gather real-time environment and traffic data, utilize “sense and avoid” technology to avoid obstructions and then zero-in on a customer’s location via GPS information shared by the recipient’s smartphone. Relaxation of the FAA’s present stance on BVLOS maneuvers would allow Amazon to shift field tests currently being done in Canada back to the US where an estimated 400 million shipments would eligible for drone delivery. With the rapid development of small drones with autonomous capabilities, the same technology may one day be applied on a bigger scale. The not too distant future may find unmanned aerial drones with the ability to carry their goods directly from cargo ships to their warehouse destination inland. Or perhaps even bypassing warehouses and accomplishing their deliveries directly to commercial stores’ loading docks themselves. Assuming that in the short term Matternet’s and Amazon’s drone systems can safely deliver goods and demonstrate capacity for autonomous last mile delivery solutions via intelligent and adaptable route shifting, the next major hurdle to overcome would be payload restrictions. Current payload capacity for cargo drone operations varies from 2.2 lb (1 kg ) (Matternet) to 5 lb (2.27 kg) (Amazon) and 500 lb (226.8 kg) (MMIST’s CQ10B Snowgoose BRAVO) at its maximum, which is still only 0.004 – 0.8 % of a 20 foot container’s existing 62,170 lb (28,200 kg) payload capacity. 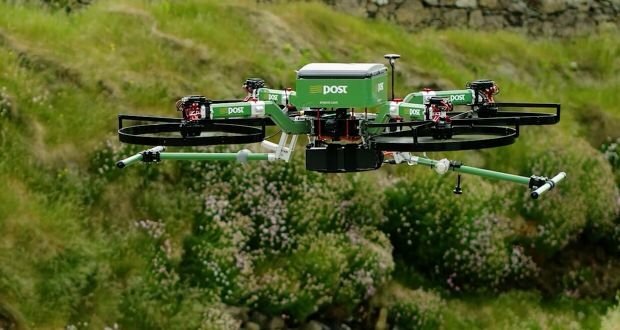 Nonetheless, with the high interest and large amount of money being poured into the development of drone delivery technology, combined with a potential internal rate of return on UAV investments as high as 50%, it is likely only a matter of time before drones become bigger and better at delivering larger goods and cargo. For now, though, let’s see if Amazon’s drones will be allowed to work at a closer and more personal level, by delivering your online parcels directly to the trunk of your car. What are your thoughts on unmanned cargo container drones? Comment below!